A Private Sail for up to 12 friends on our 40' world cruising yacht. 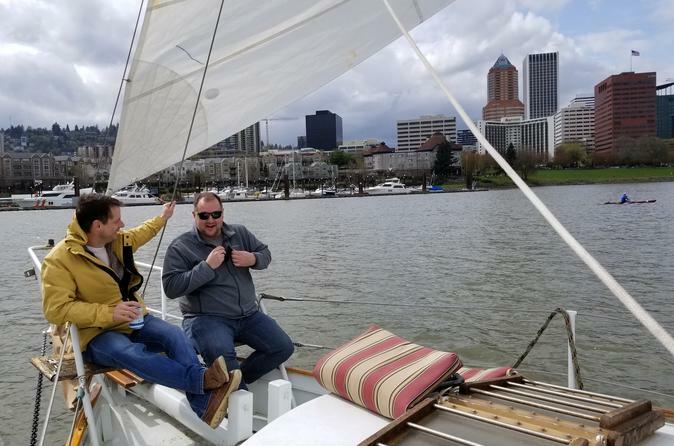 Sail away a lazy afternoon, book an hour for a stunning lighted bridge tour or go for a sail through Portland. On Longer tours, cruise up to Lake Oswego or even the stunning Willamette Falls. The Yacht is yours and your captain will do his best to give you and your friends the adventure you desire! You are welcome to bring snacks and drinks (beer and wine are fine!) to enjoy on your cruise or we can arrange catering for you. A Private excursion for up to 12 friends. Sail away a lazy afternoon or go for a tour of Portland. The Yacht is yours and your captain will do his best to give you all the adventure you desire! You are welcome to bring snacks and drinks (beer and wine are fine!) to enjoy on your cruise. You can participate in the sailing of the yacht or just sit back and relax. It can be a pure sailing excursion or we can motor to a specific location that you would like to see. Your vessel is a replica of the first boat to sail around the world with a lone person on board and, although a classic yacht, she has all the modern navigation and safety features on board. With many comfortable conversation areas for 6 to 8 people at the bow, stern and in the luxurious cabin, she makes a great family reunion or corporate outing platform for all your friends or family!